New York Mayor Bill de Blasio (D.) will launch a new federal leadership political action committee this week in order to play a bigger role in the Democratic party as he prepares for a potential presidential run after his mayoral term expires. De Blasio, who has been floated as a potential presidential candidate, will launch a new entity called "Fairness PAC," which will give direct support to both federal and state candidates in addition to covering the travel expenses of de Blasio and his wife, Chirlane McCray, according to Politico. While de Blasio has struggled to define his national profile compared to other potential Democratic presidential candidates, he told Politico he feels like he has an "obligation" to support national Democratic candidates who are trying to retake the House, Senate and New York state Senate. He defined the current political environment on the Democratic side as "electric." "I haven’t seen anything like 2018 since literally 1974," de Blasio said, reflecting on his younger days when Democrats won numerous races following the Nixon administraion's Watergate scandal. "The simple vision is, I’ve got one of the best public service jobs in America, I have one of the best bully pulpits to press both progressive change here but also to speak to it elsewhere, so I’m going to do it." De Blasio's decision to launch the PAC is likely to further drive speculation about future plans for him and his wife to run for political office, a possibility he did not rule out during his conversation with Politico. "I’m going to fill out this term, I am really excited about what we are doing in the second term and I want to carry it through," the mayor said Wednesday, sitting under gray skies on a park bench, between a meeting of the city’s financial control board and a town hall meeting on Staten Island. "I am very interested in what life is after that — certainly never have ruled out electoral office after that," he added. "Post 2021? Anything could happen post 2021." De Blasio said the Fairness PAC will de different from past fundraising pursuits, some of which have been scrutinized and criticized. The PAC will be the fourth outside fundraising vehicle he’s created since taking office in January 2014. According to guidelines, the Fairness PAC will work under restrictions that were established by the city’s Campaign Finance Board, which requires disclosure, bans certain entities from giving money to political campaigns, and limits the donations the PAC can receive. 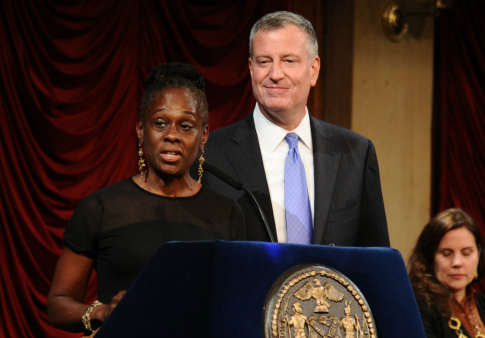 The mayor's aides said he also received guidance from the Conflicts of Interest Board (COIB). The PAC will not be governed by the COIB since it is a federal PAC versus a city-affiliated entity. "[Campaign for One New York] was to promote an issue agenda and a governmental agenda and it was a pre-K and it was about affordable housing. It was an issue-focused entity, this is a campaign entity," the mayor said. "This is a very different animal, bluntly, a more traditional animal, and the leadership PACs have existed for decades and plenty of people in this state and beyond have them." "If someone tries to make the parallel I’d say it’s literally apples and oranges," he added. This entry was posted in Politics and tagged 2020 Election, Bill de Blasio, New York. Bookmark the permalink.